Before, when I read books, I used to enjoy them simply for what they were. If I didn’t like a book, I would leave it at that- I just didn’t like it. But now, it’s different. I notice every literary aspect of the book- if I don’t like it, maybe it’s because the characters weren’t very well developed. Maybe it’s because the author threw in huge chunks of unnecessary information and described all the wrong things. When you notice stuff like that, you’re reading as a writer. When you’re just liking the book for what it is, or not liking it because- well, you just didn’t like it- then you’re reading as a reader. One isn’t better than the other. They’re just two different ways of looking at the same thing. Obviously, no one has exactly the same perspective on anything- but generally, either you read as a reader or as a writer. But no matter which way you read, you will pick things up. Even if you’re not consciously paying attention to the way the characters are developed, your subconscious will be paying attention. And then, when you go to write your own story, your writing will have improved slightly. Then you’ll read some more, and then you’ll write some more, and then your writing will have improved again. The more you read, the better you’ll write. That’s why pretty much every good writer loves to read. A picture my friend took at the theater. 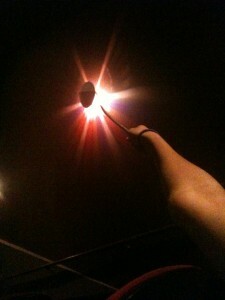 Yes, that is my arm, and yes, the light is coming from my wand. Lumos! I meant to post this a while ago. 🙁 It’s been sitting in my drafts pile, waiting to be posted. Anyway, I went to see the midnight premiere of Harry Potter and the Deathly Hallows Part 2, and I have to say… I was pretty impressed. Yeah, there were a couple things that could have been better (Voldemort’s death should have been more dramatic), but overall it was a great movie. But I don’t want to talk about the movie… I want to talk about J.K. Rowling, who possesses the true magic- of making her characters and their world come to life. Obviously all the hype about Harry Potter kept me super excited, all the way until the last movie- after which I felt like crying. I just can’t believe it’s over now. I was already heartbroken after the last book- no more rushing to Border’s and standing in line and waiting until midnight- but at least the movies still kept it alive. And now… even the movies are done. But you know something? Harry Potter isn’t dead at all. He is very much alive. J.K. Rowling put so much life into her characters- I honestly feel as if I know them. I am going read the series again (for the twelfth time), and you know what? It will never get old. Even if I read it over a hundred times. Why? Because J.K. Rowling is a genius. She wrote those darn books in such a way that the characters are real, that Hogwarts is real, that magic and spells and wands and Quidditch are all real. And that’s what an author is supposed to do. Read this sentence: No author is perfect. Read it again: No author is perfect. And again: No author is perfect. But guess what: J.K. Rowling is pretty darn close! Obviously you are going to aim for perfection. But DON’T (and I repeat DON’T) write something just because you think other people want to read it. Do you think J.K. Rowling loves every single word she writes? Of course not. But does she write because she loves to? I certainly hope so. That’s what will get you far. But don’t think that because you’re writing from your heart it’s going to be easy! Don’t think that because you’re writing from your heart you won’t get frustrated! Because you will. Quite often. But that… that belongs in in another blog post… for another day. Capture an idea you love, and follow it through to the end. Trust me. You’ll end up with something brilliant. Don’t give up. 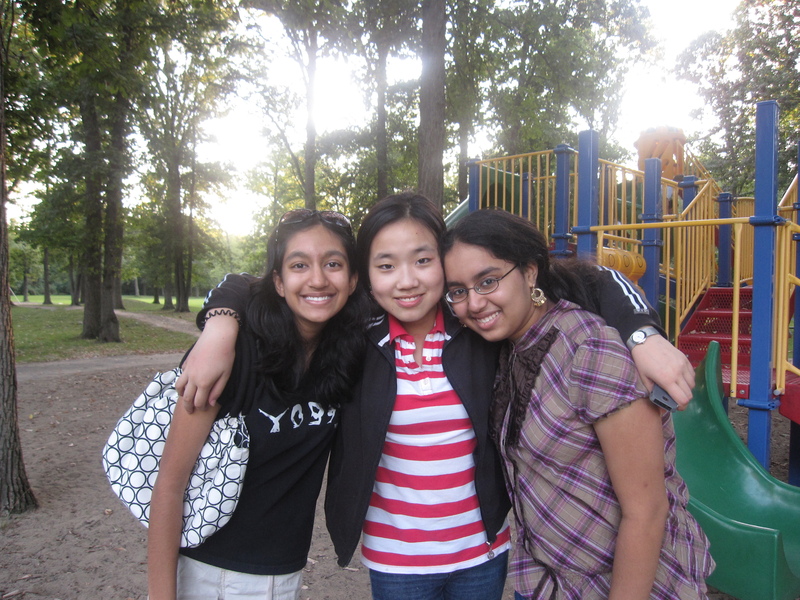 Just two of my best friends (along with myself :)). Of course there are many more, and they should know that I am eternally grateful to them as well. Let me just say that without my friends, I couldn’t live. They always know exactly what to say or do. Whenever I need to talk to someone, they’re always there, no matter how stupid the things I have to say may be. So, at the risk of sounding really mushy-gushy and cheesy, I feel the need to say I have the best friends in the world. I’m just thinking about how lonely it would be to have no one to talk to or hang out with… no one to comfort you when you’re feeling low… so just knowing that there are people to turn to makes me smile. I just feel so thankful. I really think that friends are perhaps the greatest gift the world has to offer. True friends are hard to come by, so don’t take them for granted. Treat them with utmost respect. If you know someone who understands you, who thinks the same way you do, who sees things just like you… well then. You are a very lucky person. Don’t ever forget it. Both of these quotes are from The Friendship Page; check it out if you want to read more awesome quotes. And one more thing- don’t forget, National Friendship Day is the first Sunday in August- this year it’s August 7th! 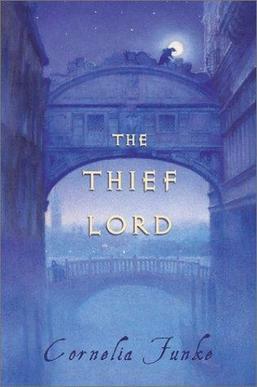 So, I just finished reading this book- The Thief Lord. And I have to say, I was pretty impressed. After escaping from their cruel aunt and uncle, orphans Prosper and Bo meet a mysterious boy who calls himself the “Thief Lord.” Clever and charming, the Thief Lord leads a band of street children who enjoy making mischief. But the Thief Lord also has a dark secret. And suddenly Prosper and Bo find themselves on a fantastical journey to a forgotten place. What they discover there will change the course of their destiny… forever. Before reading this book, I had read Inkheart by Cornelia Funke, and since I hadn’t liked that book too much (it was okay), I wasn’t sure what to expect this time. But overall, I have to say that The Thief Lord was a pretty good book. Good stuff: The story. I absolutely LOVED the story. I’ve got to say, there aren’t too many books out there with original plots, but this one didn’t seem cliche in the slightest. But enough about Harry Potter- this review is about The Thief Lord, for crying out loud! But yeah. My point is, the plot was great. Another great thing was the descriptions of Venice. Cornelia Funke was painting pictures in my mind with her language and style of writing! Her characters were also pretty well developed- Scipio (the Thief Lord) was definitely my favorite; I loved his attitude. How the book could have been even better: Not sure if this is true for most people who have read the book, but to me, it read like a manuscript that is almost ready for publishing- almost, but not quite. There are just a few minor things I’m going to pick on. First thing- sentence fluency. I know this seems really nit-picky, but some of her sentences could have been better than they were. I remember one part, where someone “came rushing.” It would have made just as much sense if the person had “rushed.” And it would have sounded better, too. See what I mean? Small things, but they make the writing flow. There were a couple instances like that. There were also a few grammatical issues (but you’ll probably find that in any book). I understand that the original text was in German, and it was translated to English, but I feel that if someone had edited it just one more time, those minor errors could have been fixed. Another thing- you know how I said it seemed like it was almost ready for publishing? Well, that’s because there were a lot of parts that could have been omitted. Seriously. There were whole chapters where nothing was happening- the story wasn’t moving along. The characters were just sitting around and talking. Remember my post on Descriptions and Details? Well, I was thinking of Cornelia Funke as I wrote it. 😛 Her descriptions are AWESOME, but she seems to have a little too much fun with them and sometimes it seems as though she doesn’t know when to stop. That’s why I didn’t like Inkheart too much. It was a brilliant idea with a brilliant plot- but there were huge chunks where nothing was happening. If the story had been written a little bit better, I think I would have liked it more. I was thinking a little about dreams today, since we seem to have them almost every night. 🙂 They can be pretty crazy- but what do they really mean? Heck, I don’t know. I don’t even know if it matters. All I know is that they could potentially make really good stories… well, most of them. I once had a dream that my Econ teacher wouldn’t let me leave class until I had named all the countries of Europe. Okay, so maybe that wouldn’t make such a good story on its own, but take that idea- the idea of something depending on something else. Maybe a girl’s father is kidnapped or imprisoned or something, and he won’t be released unless the girl does something for the kidnapper. That could be the initial idea, but there are so many questions that branch off of that- does the girl trust the kidnapper? If not, then she needs to find a way around the deal, because otherwise she could do what the kidnapper asks, and he could just kill her father instead of releasing him. Or what if the kidnapper is a mysterious figure… and when the girl finally finds out who he is, she is shocked because it’s someone she knows. See? There are so many paths you can take with one simple idea. And that idea could come from a dream. 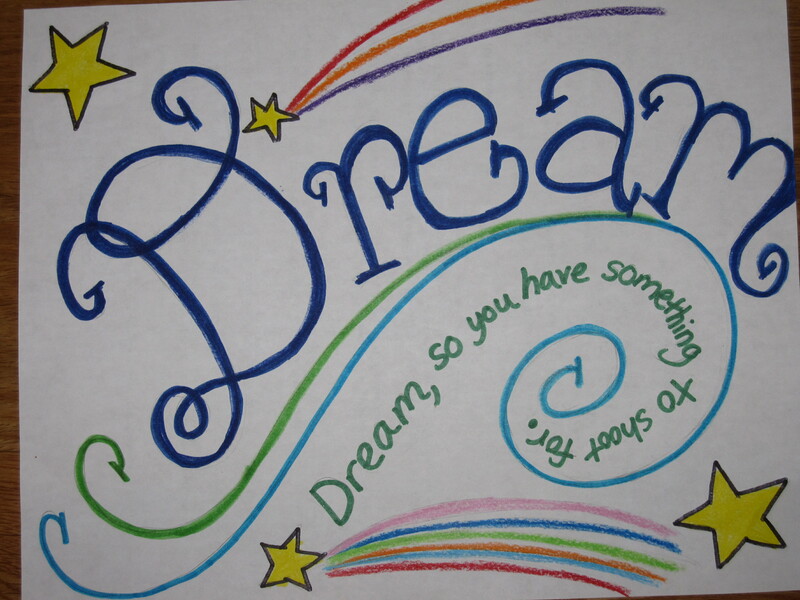 My advice: Write down your dreams (or, in this technological era, type them :)). It doesn’t have to be every day… just now and then. It could be once a month. Then, when you’re feeling low or looking for inspiration for a story, read them. You won’t be disappointed.